I’ve recently shared how you can compare Word Documents and merge them into one,WinMerge is an Open Source differencing and merging tool for Windows that can compare both folders and files, presenting differences in a visual text format that is easy to understand and handle. Editor with syntax highlighting, line numbers and word-wrap. Supports DOS, UNIX and Mac text file formats and also Unicode. You can also extend the file comparison feature to other files like excel,power point,pdf, etc using a plugin called docdiff WinMerge Plugin which lets you compare word and excel documents without MS Office installed on the system. 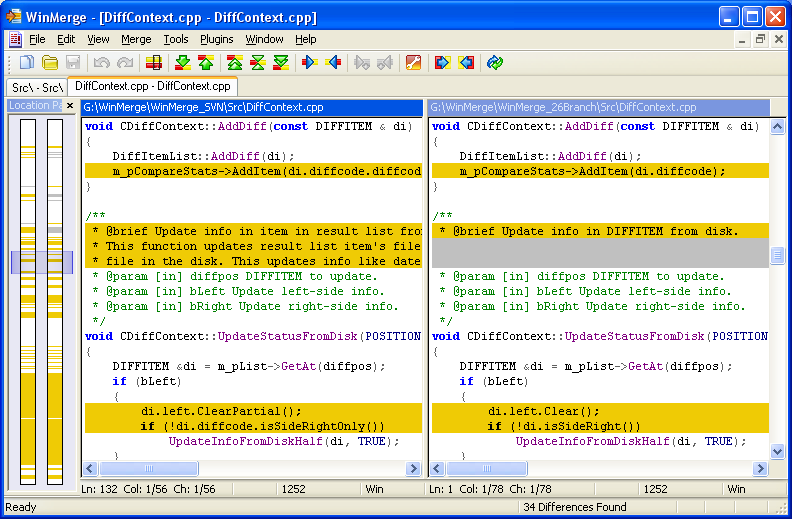 While comparing both the files should be given as input and the files are opened in two panes in a single window showing the differences by highlighting the differences in the line numbers. Folder compare shows all files and subfolders found from compared folders as list.You can also synchronize folders by copying and deleting files and subfolders. If you are on the move you can carry a portable version of WinMerge available at PortableApp’s which can be copied into your USB pen Drive.